Psychological growth takes place specifically between two opposing pulls. One is the need to grow and adapt, and the other is the need to preserve safety and the illusion of safety. 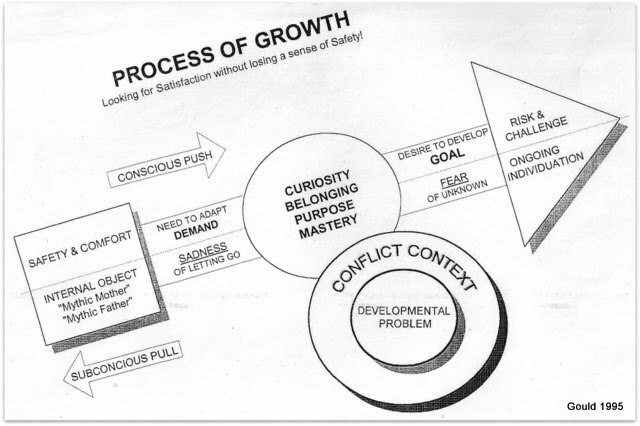 Adult development is the gradual replacement of the child's sense of safety (which is now an illusion) with actual grown-up safety anchored in mature decisions. The process of psychological growth gets STUCK when there is a failure of adoption. When there is a situation in which inner and/or outer reality demands actions, and the action is not taken, there is psychological pain. Symptoms are a consequence of being stuck and a sign that adaptation is required. The study of adulthood in social context is in its infancy. Though, since the time of Freud, adolescence has been shown to be a period of dynamic and vital growth, the conceptualization of the periods of adulthood following the identity struggle of youth has not changed significantly. No coherent view has been offered of the progress through time or of the psychological growth and change of adults. Adults are conceived of as being in dynamic conflict, but without direction. The resolution of conflict is thought to lead to higher levels of integration and adaptation, but not into a new era of personality. Adulthood is often seen as a period of marking time. In recent years, this static picture of adult life has been challenged by the richer view that, like childhood, adulthood is a continuation of the separation-individuation process with a distinctive phase pattern that is tied to the age-related demands of the life cycle and to the contingencies of the situation. Although there may be disagreement concerning the specific labeling or exact timing of the phases, adulthood is clearly a discrete period of development. Attempting to grow is relentless and normal. This growth takes place during the transitional periods, as the adult encounters unfamiliar demands and new situations that require him or her to correct parts of the unrealistic idealized images formed in childhood. A person who grows a step separates from something that was and becomes a more fully individuated human being. The intrapsychic struggles of individuation in childhood and adolescence are implicit in the task of separation from objects propelled by concurrent physical and physiological changes. Both are mediated by time. In fact, both object and biological changes continue throughout life, and object changes are even more dramatic after age 21. Assuming that ego autonomy is the ideal state of individuation, under what conditions does it prevail? Being autonomous while living alone is entirely different from being an autonomous spouse. Maintaining autonomy while sorting out the pressing demands of spouse, family, and occupation is more difficult than previous tasks and requires a more highly integrated psychic apparatus, if an optimal level of individuation is to be maintained. If anything, the additional stresses of seeing one’s parents aging and needing to guide one’s children suggest that time-mediated object changes are of the utmost importance during the adult years and that the capacity to change is a necessity. Researchers, students, and observers of adulthood development do not agree on what constitutes developmental progression. Some regard it as passage through a transitional period during which new coping skills are acquired: others, particularly psychoanalysts, regard it as recognition and mastery of some aspect of the nuclear neurosis of childhood. For Erik Erikson, Daniel Levinson, and the author, it is a new posture or reconfiguration of the self in response to age-related realities of the life cycle. For George Vaillant, it is the substitution of more mature, reality-attuned ego defenses for the immature defenses that served in childhood. There are even some who are not sure there is any adult development. They see changes of behavior that appear to be developmental as merely new responses to changing contexts, responses that were always available but were never before called up. Despite these differences, there is at least one common element. Each definition identifies a specific changing pattern of behavior that is responsive to a new set of facts. An adaptational response is required to meet some demand implicit in a situational context and that context is frequently a transition, a crisis, a stressful situation, or a challenge. All people change with age, because new priorities in the life cycle require it. New attitudes and new behavior can be straightforward responses to new circumstances when there is no internal conflict among the agencies of the self. The reality of facts (or role or responsibilities) dominates the response of action or attitude. The person’s change is a conflict-free adaptational response. As people get older, they necessarily go through many such adaptations and demonstrate many new behaviors and attitudes. Sometimes people cannot respond with the appropriate adaptational response, because that response is mired in internal conflict (inhibitions, defenses, character patterns). Their challenge is to free that response from conflicts so as to be able to respond appropriately and effectively. If they successfully resolve conflict that caused them to be rigid, they recover necessary functions that arc defined by the actions they take. Most patients come to treatment with symptoms that are consequences of a developmental struggle triggered by an adaptational demand. Since any demand inherent in the situation calls for a piece of psychological work, only those responses that represent a significant piece of work that involves the resolution of a conflict and has structural change as an outcome are truly developmental. Those who say there is no adult development but merely behavioral changes in response to changing circumstances are observing a simple non-developmental pattern change in a person for whom little conflict is associated with making that particular change. At the other end of the spectrum, therapists frequently observe immense struggles in patients responding to normal demands in the environment. The resistance to change is tied either to a nuclear neurotic belief system or to a powerful defense strategy. Attempts to change are countered by the activation of increasing levels of negative affect, the content of which is catastrophic predictions about potential adverse consequences. A patient who is having so much difficulty changing a simple behavior pattern is often observed to be confusing the inherent demand of the current situation (which calls for a relatively easy change of behavior) and some earlier adaptational demand that required the patient to mobilize or maintain the pattern that now ought to be changed. The patient’s conflict is between two different frames of reference in time; it is a situation in which the past has more power to compel behavior than does the current situation.